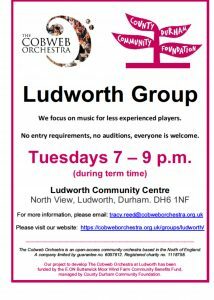 We meet at a friendly community centre in Ludworth, which is only 7.5 miles away from Durham. 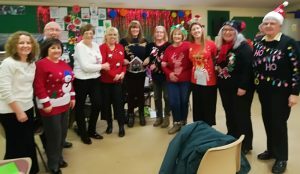 This is the newest Cobweb group and it is getting bigger each week! It is a little different from the others as it is focused on making music that is more appropriate for less experienced players. 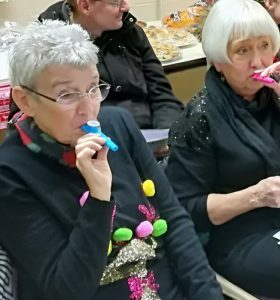 Cobwebbers who turn up even with a second instrument are very useful as they are able to give support and share their advice. 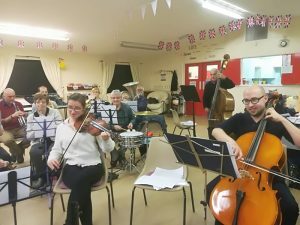 We play a range of music although still aspire to explore pieces from across the orchestral repertoire, sometimes using arrangements that are less demanding. The map problem is being looked at now. Click ‘ok’ to see a temporary ‘greyed out’ version. 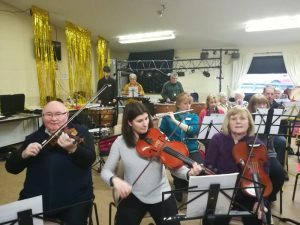 There’ll be another exciting range of music to try, including ‘Purcell’s ‘Abdelazer’, ‘Jerusalem’, ‘Pirates of Penzance’, ‘Let it be’, and some ‘Epic Movie Themes’. 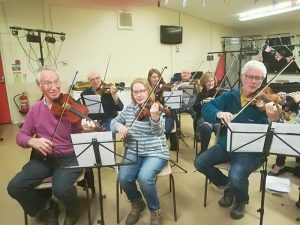 We may also revisit some of our ‘old’ music in preparation for our summer concert, such as some Mozart dances, Dvorak’s ‘Largo’, ‘La cucara-cha-cha’, ‘Sound of Music’, ‘An African song in Johnshaven’ by Richard Ingham, and ‘New York, New York’ that everyone enjoyed at the Cobweb ‘Big Play’ event. 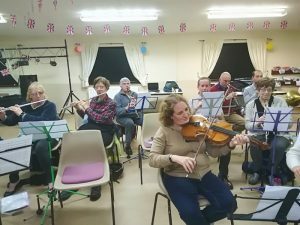 We had our first taster session on 19 January. 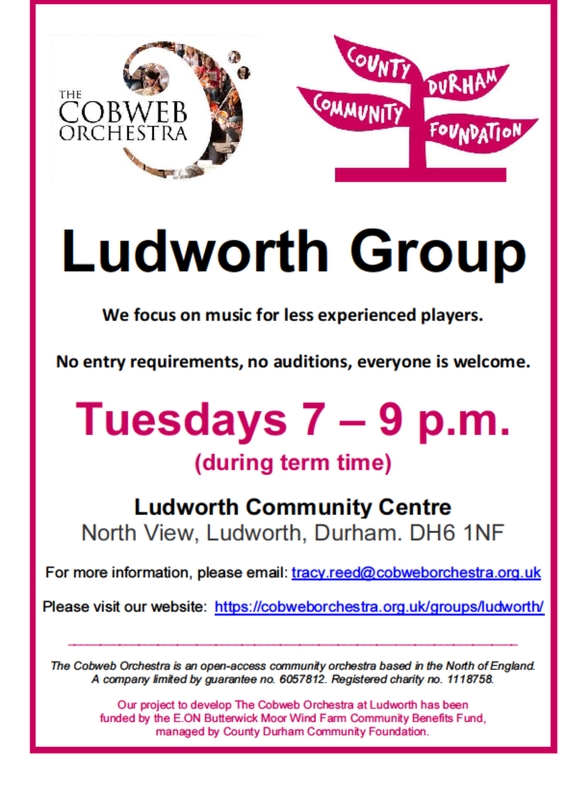 If you’re a Ludworth player already, you may spot someone you know trying a different instrument! You can read more here. We will be having another free taster session on Saturday 11 May, 11 am – 4 pm. We want to encourage as many people as possible from the community to experience the joys and benefits of making music with others. 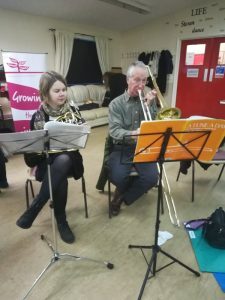 Anyone can come and join in, even if you are a complete beginner and even if you haven’t got your own instrument yet. The Cobweb ‘instrument bank’ will be available again, and tutors to give you guidance on how to play the instruments, and how to follow the music. There’ll be a bring-and-share lunch, plus coffee and tea for a small price. You can download the flyer to help us to advertise the event here. 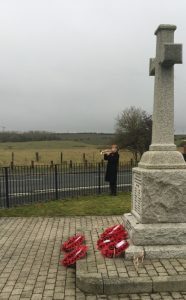 There’ll also be a concert on 13 July at Shadforth Church. Look at what else we get up to! 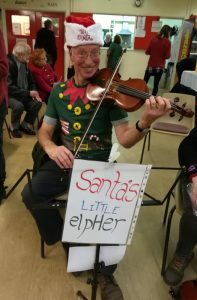 The Elvaston Ensemble have so far helped to raise £730 for Ludworth Cobwebs from their two concerts at St Mary’s Church in Shincliffe. The Elvaston Ensemble met through The Cobweb Orchestra. 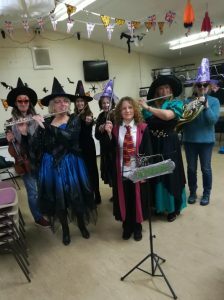 They are: Ludworth conductor Tracy Reed (clarinet), Chrissie (flute), Anita (oboe), Rye (bassoon) and Clare (horn). For further details, please see our performance page.